A marble vase with cylindrical sides below an outcurling lip, the bottom carved with convex fluting separated by fillets. The carved lower part and the undecorated sides are connected by two 'tubular' handles on opposite sides which curve upwards close to the body of the vase. For a more elaborately carved version of this class of marble krater (ornamented with festoons, masks, and acanthus), compare the Pentelic Marble example in the Museo Torlonia, Rome1. Several examples from Pompeii and Herculaneum in the Naples Museum2, set on square bases with foot supports, show the same form used in bronze for household or ornamental purposes. 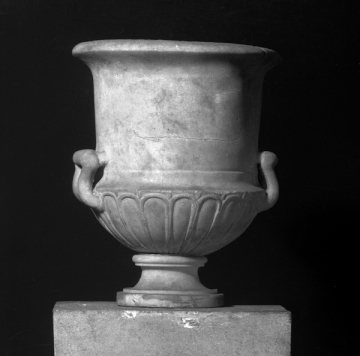 This vase was displayed by Soane on top of cinerary urn Soane M373 (Vermeule 338). 1 Visconti, P.E., Catalogo del Museo Torlonia di Sculture Antiche (Album of Plates), p. 167, no. 342, pl. LXXXIV. 2 Chiurazzi, p. 250f; nos. 73098, 73103, 73104.